The Family Panel Reviews : Vegessentials - Fresh Kids On-The-Go! Vegessentials - Fresh Kids On-The-Go! 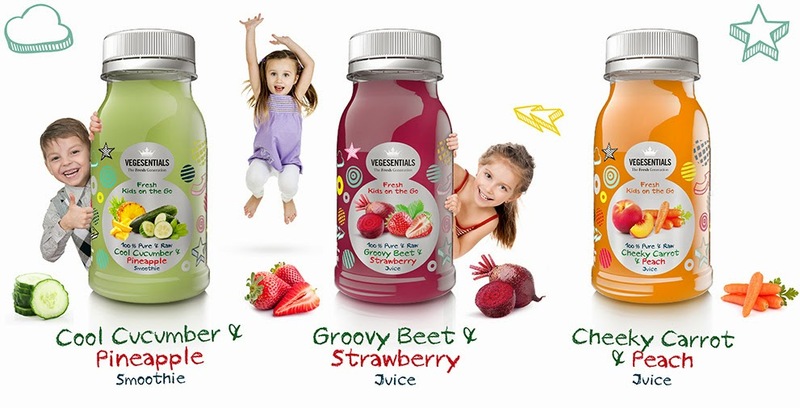 Guest Reviewer, Mellow Mummy has been trying our a new range of raw fruit and vegetable drinks from Vegessentials designed for children. Vegessentials make unpasteurised fresh fruit and vegetable drinks and smoothies and the Fresh Kids On-The-Go range is a new range designed specifically for kids. I don't normally struggle to get my two girls to enthusiastically eat fresh fruit and vegetables, but I know many parents do. The Fresh Kids On-The-Go Vegessentials range features cute 125ml bottles with child-friendly flavours - Cool Cucumber & Pineapple, Groovy Beet & Strawberry Juice and Cheeky Carrot & Peach. The range is available in Whole Foods and Ocado. I shall admit now that neither of my girls enjoyed the juices! But I did. I think the girls were put off by the vegetable element because it was so alien to them. Both of my girls LOVE cucumber but even I found it rather unpalletable in a drink and I've not enjoyed the juices which feature cucumber in them. I did very much enjoy the Groovy Beet & Strawberry Juice; beetroot gives it a very warming edge to an otherwise light strawberry juice... it tastes almost hot! My favourite juices from Vegessentials have been the Ones with a sweeter touch which is why the Cheeky Carrot & Peach flavour is my favourite. For a fresh, unpasteurised drink I was surprised at how long the use by dates were on these juices and smoothies although I would recommend giving them a good shake before drinking because, if you leave them a few days the juices settle and all the veggie goodness settles to the bottom. I've always liked the idea of making my own interesting juice mixes but I've never had the energy or enthusiasm to go about juicing my own fruit and vegetables (I'm worried about the mess and the effort involved to prep!) so a ready-mixed fruit and vegetable juice is a good idea. It's just a shame that the girls weren't that enamoured with Vegessentials.